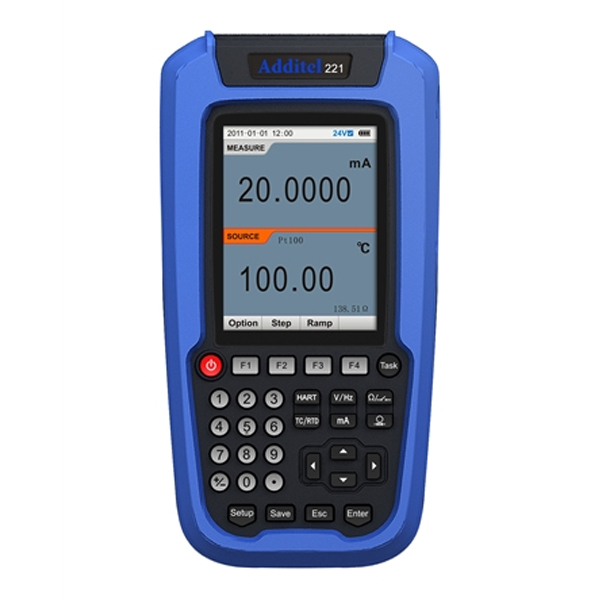 A highly integrated Multifunction Temperature calibrator featuring several patented technologies, ADT 221A is an ultra-compact, rugged, and ease-to-use hand-held device for sourcing, simulating and measuring, temperature, and electrical signals. Its smartphone-like menu and interface make the operation simpler and easier. ADT 221A is ideal for calibrating, maintaining, and troubleshooting process instrumentation. Automation and documentation capabilities make the ADT 221A a turnkey solution. • Set up automated calibration procedures, and ADT 221A performs the test, calculates the errors, displays and/or stores the results in the memory, and highlights the out-of-tolerance points. • Create as-found/as-left procedures, record and document results for quality control. English, Chinese, Spanish, French, Italian, Russian or Japanese. ADT 221A Multifunction Temperature calibrator is a process tool for measuring, sourcing and simulating mA, mV, V, RTDs, thermocouples, ohms, frequency and pulses, captures switch values and provides 24 V loop power.